Some time ago I have been able to add to the workshop a Lorch, Schmidt & Co. WW No. 7 lathe, complete with screw-cutting attachment. 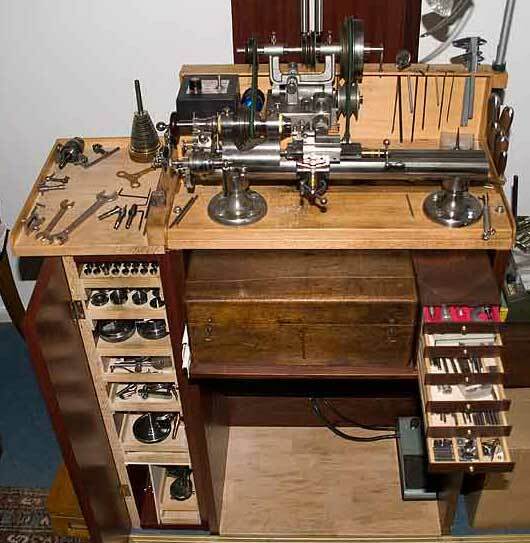 It sports various larger attachments that make it more suitable for precision engineering rather than watchmaking, such as a large Lorch 4-jaw chuck/faceplate, a large Lorch 6-jaw chuck, and a large 3-jaw chuck (from Sherline), plus an original Lorch standard 3-jaw chuck. The lathe is mounted on a removable sub-board, so that it can be exchanged for the 6 mm outfit that is mounted on a similar base. They are driven by a Sherline variable speed motor through a larger-size Lorch countershaft assembly. (5) The dog clutch in detail (disengaged) (6) and from the back (7) WW Lathe set-up. In the back is a more substantial countershaft than shown above. It is fitted in addition with an idler pulley that tightens the primary belt from the motor shaft. The 100 mm 4-jaw chuck is mounted on the headstock. (8) Screw-feed tailstock. (9) Simple tailstock (10) Collet-holding lever-fed tailstock with shop-made micrometer depth-stop (11) A hand crank gives more torque and feel when in the last passes for a bigger thread. (12) A rare attachment: the original fixed steady-rest. The brass pads are shop made. Note: I replaced the original slotted screws with Allen-screws that are easier to get to using a hooked hex-key.